External antenna for the eNet DRA wireless receiver module and eNet server DRA in unfavourable installation conditions (e.g. metal distribution cabinet or sub-distribution). The additional antenna is to be placed outside the metal housing, e.g. with a distribution box or sub-distribution. 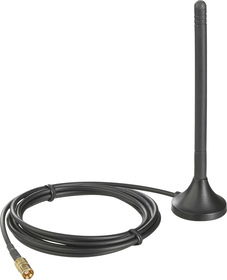 The additional antenna&apos;s supply cable can be extended by GPS antenna extension cable (SMB jack/SMB plug).